About 300 million years ago, shallow seas covered much of North America. When those seas receded, concentrated pockets of saltwater were left behind, eventually forming gypsum deposits scattered around the continent. In Southern California, halfway between the Pacific Coast and the Arizona border, one of these ancient deposits is being mined by the United States Gypsum Corporation. The chalky, white powder is used to make drywall and plaster. It also happens to be a reasonable stand-in for the icy surfaces of Europa and Enceladus, and the Martian polar regions. 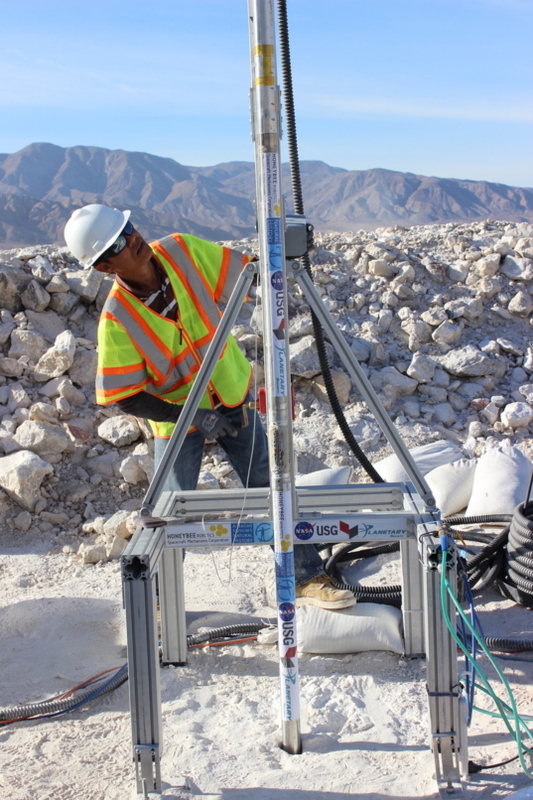 For about six weeks in November and December 2015, a small team from Honeybee Robotics in Pasadena, California spent their weekdays at the USG quarry, commuting back to the L.A. area on the weekends. They were testing the Planetary Deep Drill, a technology prototype designed to chew tens—and eventually, hundreds—of meters beneath icy planetary surfaces. The Planetary Deep Drill being lowered back into the hole it is in the process of drilling--during its first field test in December 2015. Shown is Honeybee Robotics' Huey Nguyen. Honeybee planetary science technology has been previously used on Mars landers and rovers. The company hopes the Planetary Deep Drill could one day be installed on a future spacecraft to collect deeper-than-ever subsurface samples. 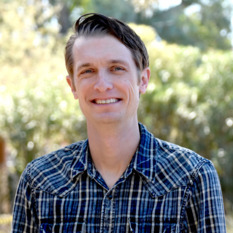 The USG quarry field test, sponsored by The Planetary Society, went "surprisingly well," said Kris Zacny, Honeybee’s vice president and director of exploration technology. "Normally, we expect things to break in the field. Not much broke," he said. His team's problems turned out to be as minor as replacing an occasional sponsor decal on the side of the drill. The prototype drill is four meters long. It dangles from power and data cables, which reel the drill in and out of the ground. Rectangular shoes grip the sides of the bore hole while a tungsten carbide drill tip spirals downward from the casing. When the drill's auger fills with shavings, it is reeled up to the surface for emptying. Future versions of the drill could shrink to just two meters to fit onto a lander or rover. The current, four-meter version was braced around its borehole with a metallic frame. In a nearby U-Haul truck, Honeybee engineers set up a makeshift mission control to monitor the drill's progress, using telemetry fed back through data cables. "We knew we were going to have to bring a U-Haul truck," Zacny said. "One option was to bring the U-Haul truck, drop everything and drive the truck back to Pasadena. Or, we could keep it there and run everything from the truck." He said the team previously considered a large, domed tent, with the drill apparatus sticking out of the middle. 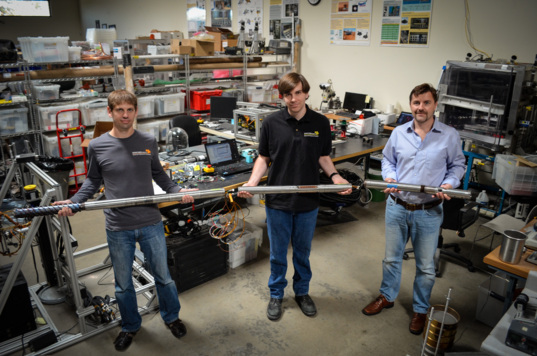 Gale Paulsen, Justin Spring and Kris Zacny hold sections of the 4-meter-long Planetary Deep Drill at Honeybee Robotics in Pasadena, California. For the field tests, a pair of diesel generators powered the drill. Zacny said it consumed an average of about 100 watts of power, fluctuating between 50 and 250 watts, depending on the composition of the gypsum. A spacecraft on Mars, of course, wouldn't run on diesel. It would likely use a nuclear-powered radioisotope thermoelectric generator, or RTG. The Curiosity rover's RTG originally charged the spacecraft's batteries at a rate of about 110 watts. "So you're hitting the energies and powers that can be supplied by a Curiosity-sized power system," Zacny said. NASA has taken an interest in the Planetary Deep Drill. The project was awarded funding by the agency's Planetary Science and Technology through Analog Research program, PSTAR. Scientists from NASA’s Jet Propulsion Laboratory attended the USG field test, including Rohit Bhartia, the deputy principal investigator of SHERLOC, an ultraviolet light spectrometer that will fly on the Mars 2020 rover. SHERLOC will be used to search for organics and other signs of past life on Mars. Bhartia is working with Honeybee to miniaturize a version of SHERLOC to fit inside the Planetary Deep Drill. To do that, the shoebox-sized instrument will need to slim down. "When we go into a bore hole, we have to get kind of skinny," Bhartia said. "So we have to effectively unfold the optics to fit into a linear structure." His team created a similar instrument that was installed on a drill that tunneled a kilometer beneath the ocean floor. Bhartia said the instrument was re-shaped to fit into a narrow, six-foot-long cylinder. SHERLOC works by shining an ultraviolet light at a material, which causes the material to shed photons. Those photons can be analyzed to detect organics and reveal the material's mineralogical composition. A direct detection of organics beneath the surface of Mars or an icy moon would be an important discovery in the search for past and present life beyond Earth. But since organics can also be formed by non-biological processes, scientists wouldn’t be able to confirm the existence of life with a single data point. The Honeybee team plans to head back to the gypsum quarry for more testing this fall. If things go well, they’ll take the drill to Greenland for more ambitious field tests on actual frozen terrain in 2017. 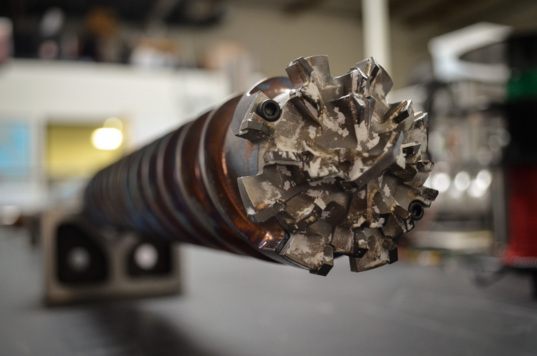 The tungsten carbide tip of the Planetary Deep Drill is stronger than steel and capable of chewing through planetary subsurfaces. Color me confused, but if the drill is regularly coming up with shavings, why do they need to send SHERLOC down the borehole? Also, if they want to test the drill on frozen terrain, we've got much more accessible, still very deep glaciers here in Iceland... just saying ;) You don't need a helicopter to get out to a test site here.